If I were a fashion designer, I would watch Turner Classic Movies 24/7 for inspiration. And seeing this recent gorgeous Technicolor release from Fox Cinema Archives just one day after the Oscars confirmed for me once again that the most beautiful fashion is straight out of the past. 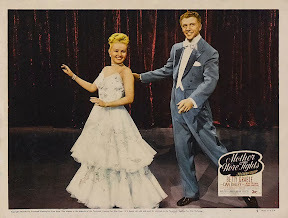 More specifically, I couldn’t help but realize that a gown worn by Betty Grable during the onscreen performance of the Oscar nominated love song “You Do” not only manages to steal the focus from the tune itself but also looked like it could’ve easily walked the red carpet and made the best dressed list the night before. Of course, as gorgeous as it is, there’s no upstaging Grable in Mother Wore Tights, which is her own personal favorite out of all her pictures. 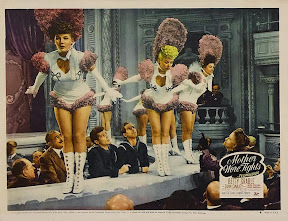 The film, based on Miriam Young’s book by the same name about her song and dance team parents who were vaudeville headliners became not only Grable’s most successful movie to date but also Fox’s highest grosser of 1947, taking in more than five million dollars alone that year at the box office (which intriguingly, would’ve made it a flop today). Directed by Walter Lang, who would go onto helm one of the studio’s strongest Hepburn and Tracy productions with the underrated Desk Set a decade later along with creating movie musical history with the classic The King and I in 1956, Mother Wore Tights is noteworthy for kickstarting another screen pairing. As such, it’s the first feature with Grable and the man she called a friend for life offscreen – Dan Dailey – who would reunite with her three more times again onscreen throughout their careers. And while it’s Grable – pregnant and hoofing up a storm regardless while even managing to do one of Dailey's numbers better than he did – that captures our hearts the most in a movie that wisely makes the most of her bubbly, All-American girl next door appeal, the film begins to run out of steam in the last act. 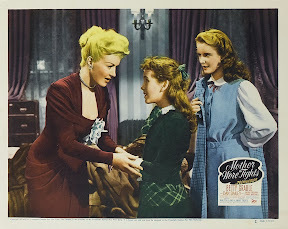 Narrated by an uncredited Anne Baxter as the screen version of the author Miriam Young, who wrote the book that Lamar Trotti’s screenplay is based on, Mother loses its momentum by unsuccessfully trying to shift its focus away from the tale of the headliners juggling the responsibilities of career and family with a sudden emphasis on their children. Awkwardly trying to position the plight of the older daughter’s romantic coming-of-age to the forefront, Mother sacrifices the building blocks of the story it had been previously telling by pushing Grable’s eponymous mother further into the background. Needless to say, this is the last place we want her since (as portayed) the daughters aren’t nearly as interesting as our heroine from the first hour of the movie. While the costume design by Orry-Kelly, which is showcased to glamorous effect by Harry Jackson’s Oscar nominated color cinematography keeps us dazzled, ultimately it’s Grable who shines brighter than any glittering gown and helps Tights hold up so well despite the 107 minute running time that begins to feel much, much longer in the final act. In other words, it’s a long Mother, but this musical about a vaudeville mother still knows how to deliver on the promise of entertainment more than sixty years later on Fox Cinema Archives DVD.